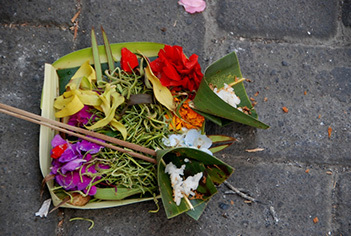 The Balinese people are deeply spiritual, they make offerings to the Gods several times a day known as Canang and more during the regular ceremonies or festivals. 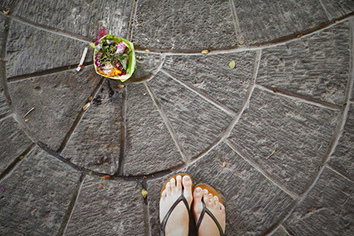 You are likely to see the little palm leaf offering trays laid out in doorways and on the footpath whenever you venture out. They generally are full of flowers and have a lit incense stick. If you want to be respectful try not to step on them, drive over them or interrupt anyone who’s in the middle of saying the accompanying prayers as they are laid down. Sometimes on holiday things go wrong, luggage can be lost at the airport and flights can be delayed or you may even need to cancel your trip. So if you want to save yourself stress, then grab some travel insurance before you leave. We’ve found that just taking out a policy is almost a guarantee that no mishaps will happen, but if they do, you’ll be so grateful you spent the money. 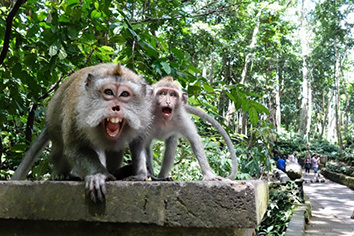 If you travel up to Ubud or Uluwatu for some sightseeing – don’t try to interact with the monkeys remember they are wild. They are cute and funny, but they’re also mischievous and unpredictable. Despite all its modern elements, Bali is part of Indonesia where rabies is still a possibility. 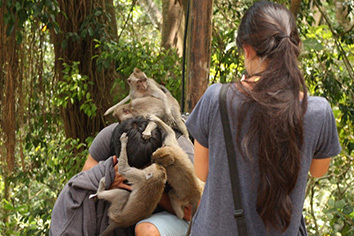 The rabies vaccine is expensive and not always available, so it’s best just not to try to interact with the monkeys. The photograph isn’t worth the risk of getting bitten or having your valuables taken. Go-Jek is a combination of Uber and Food Panda. 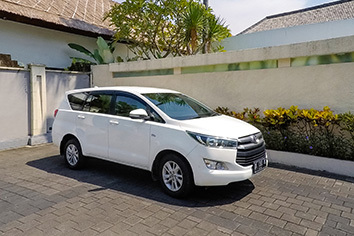 It allows you to order everything from food delivery from hundreds of restaurants to a massage in your villa and is a great way to beat the traffic and is much cheaper than taxi’s. We recommend you download it upon arrival and use their fast service as a shortcut to make your Bali adventures flow seamlessly. If you do decide to rent a scooter, then please wear a helmet – its the law despite what you might see. It’s just not worth the risk to get that feeling of the wind in your hair. Your brain is an incredible organ, and we don’t want you to put it at risk. The traffic is sometimes a little crazy here so be a legend and wear a helmet. It may just save your life. 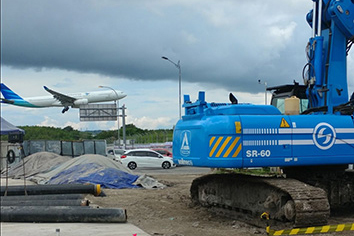 Sometimes the causeway to Denpasar airport has construction or delays so leave early, you never know when the road could unexpectedly close for a ceremony and it’d be just awful to end your Bali holiday with a missed flight. 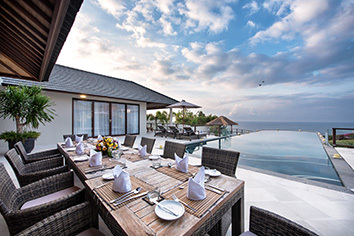 If you’re staying in with us at Asia Holiday Retreats, we can quickly organise a driver to get you there on time. If you’re in a restaurant and you get excellent service don’t hesitate to tip your wait staff. Although most establishments charge what’s called ++ (a 20% tax and service charge), the employees don’t always get their share of this. Their average wage is meagre in comparison to wait staff in the rest of the world, so they’ll greatly appreciate any gestures of gratitude you feel moved to make. It’s best to slip it to them personally with a smile and use your right hand to be polite. 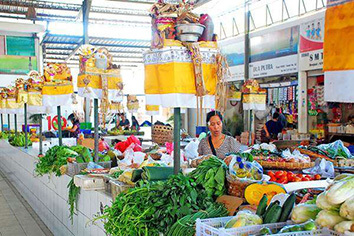 The mornings are the best time for shopping at local markets and in the high fashion boulevards . The first sale of the day signals good luck to the Balinese so you may get a special discount. 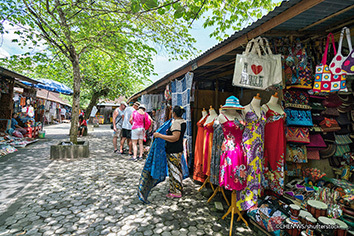 Also, the heat is bearable before midday so you won’t sweat through your shirt if you want to wander along Petitenget and take advantage of the fantastic deals. The rainy season is famous for monsoons and powerful downpours that feel as if they will never stop. Don’t be fooled though – they will be over more quickly than you think! Bali weather is unpredictable, but it changes fast so expect the best, don’t cancel your plans and keep a raincoat on hand just in case. The skies can be grey one moment and then blue again before you know it. 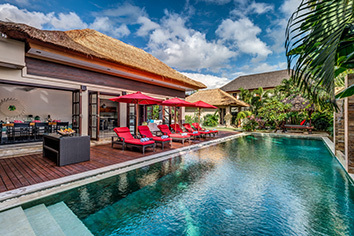 Do Bali in style stay in an incredible villa! One of the reasons Bali is such a popular tourist destination is the value for money that’s possible. You can rent stunning villas in gorgeous locations for a fraction of the price you’d expect to pay in Europe or Australia. 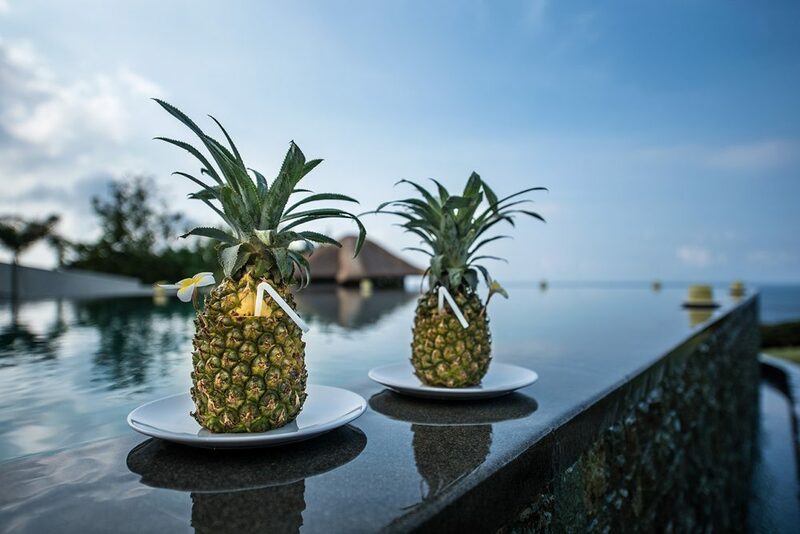 We specialise in providing our guests with boutique Bali experiences so click here to see a range of Bali villas that will make you feel like a king or queen for your holiday.